• Do not leave the keys in direct sunlight, or in locations with high temperature or high humidity.> • Do not drop the keys or set heavy objects on them.> • Keep the keys away from liquids.> • Do not take the keys apart except for replacing the battery. Use the keys to start and stop the engine, and to lock and unlock all the doors, and tailgate. 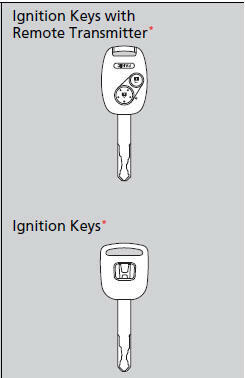 You can also use the remote transmitter* to lock and unlock the doors, and tailgate. Keep the key number tag separate from the key in a safe place outside of a vehicle.